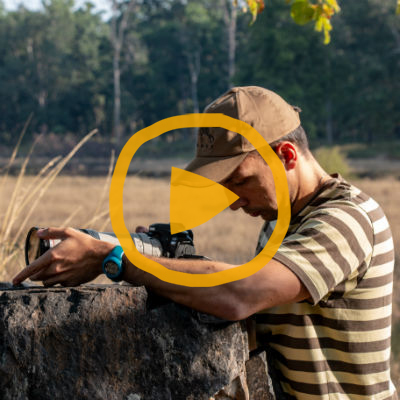 Born Free’s filmmaker Filip Fortuna goes on the hunt for wild tigers… with his camera! It was still dark and the dawn seemed hours away, but I was wide awake. My one-week adventure of filming tiger conservation initiatives, the Satpuda landscape and its wildlife was coming to an end. But I was going back into the jungle to look for tigers one last time. Not encountering tigers was looming over my head. It was my last day in India and the chance of capturing any footage of tigers was close to zero. Still under dim morning light and on board an open Maruti Suzuki ‘gypsy’ vehicle, I entered the forest. Minutes later, I heard loud alarm calls from nearby sambhar deer and birds. A tiger was nearby. Suddenly from the high grass a huge tigress appeared. She started walking towards me confidently and hissed. She was known by the name of ‘Shy’ but there was nothing fearful about her movements. Then her subadult cub joined her on the road and they started walking towards me. I quickly rested the camera bean bag against the vehicle and started filming. It was still very early in the day and the sun was not breaking through the morning mist of the forest. I knew that the filming conditions weren’t ideal as the footage would be a bit underexposed, but there was no time to lose. Camera shutters were going off like mad around me as if I were on a battlefield, but I was in the zone, calm and making sure that my camera had enough stability and access. Moments later they were joined by another subadult cub. Just over one-year-old, the cubs were already sizeable figures, but showed their childish curiosity and playfulness. The tigress didn’t lose awareness of her surroundings, carefully pointing her ears and absorbing the sounds of the awakening forest. The two cubs showed affection towards their mother. ’Shy’ was being a towering presence over her ‘little’ cubs. What an incredible experience to be in the presence of these magnificent beasts. And I had it captured on my camera. But behind the scenes it was far from ‘smooth sailing’. Other vehicles were scrambling for better positions. My vehicle wasn’t the first one on the line, so getting clear shots required handheld filming at times. With a 100-400mm lens, that was a major challenge. 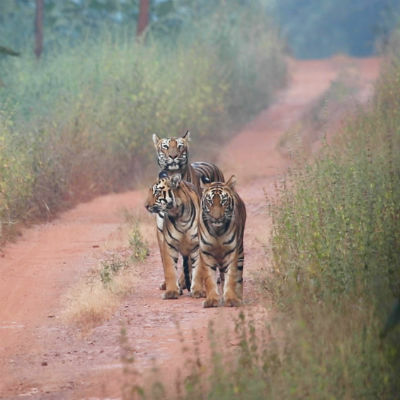 Fortunately, the tigers lingered on the road for a good 10 minutes, before disappearing into the forest. The tiger trio were on a hunt. I heard a terrifying death cry of a sambhar deer. Multiple bird alarm calls were coming from the scene. It meant that the tigers had made the kill and wouldn’t be leaving their prey for the next few hours at least. That also meant my filming of these tigers was most probably over. And so, the day that had barely started already seemed fulfilled. Of the many stories and remarkable people that I got to capture during my trip, filming tigers in the wild, in their natural habitat, was by far my best experience.